Another article about JUG-AFRICA published on Oracle website Oracle.com (http://tinyurl.com/3mf4m6t). As some of you already know. The next edition of JCertif is coming. This year again the JCertif Conference will bring together developers from across Africa to learn, collaborate, and inspire each other. This year, we're happy to announce 3 days of Java and Android training and 2 days of great talk, focusing on key areas where Java and open source are driving innovation: Java, Android, HTML5, JavaFX and JavaME. If you feel like living a bit of an adventure, get acquainted with a different culture and meet great people, during an event other than the “classic” ones, then this is for you! We’re expecting 800+ attendees, based upon our previous events and several hundred people who are already registered. - Arun Gupta (Oracle). Yes! Arun will be the keynote speaker ! The final list of speakers will be published in few weeks !! PS : We're still looking for one more speaker for HTML5 (contact us : info@jcertif.com). Hope to see you in Brazzaville ! 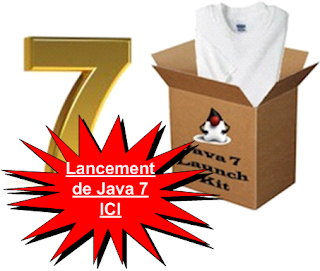 The month of July was a global gathering for all Java Communities around the world to say "Hello" to Java 7. JUG-AFRICA also hosted multiple events to celebrate Java 7 (see the photos below). I have traveled in Africa to give technical Java7 talks and met with hundreds of vibrant Java and Android developers. In Dakar, Senegal (July 7), Brazzaville, Congo (July 9) and Kinshasa, DRC Congo(July 10). Oracle provided the Java launch kits, which include a Java 7 technical presentation with detailed speaker notes, related technology modules, and T-shirts for JUG members. More than 90 JUGs have also accepted Oracle's offer to supply speakers including four JUGs in Africa (SeneJUG, CongoJUG, EgJUG, KinJUG and RDC-JUG). The events where held in Dakar, Brazzaville, Kinshasa, Cairo, Abuja, Lagos, Kampala, Lomé, Accra, Ouagadougou and Rabat. I'm very happy about the progress of Java in Africa and the collaboration between Oracle and the user community there. Yes, I can agree on : With Java 7 event across the world, Oracle's demonstrated commitment to fostering strong and independent groups worldwide and to ensuring that the groups have a powerful voice. Here is a list of most Java7 launch events that JUG-AFRICA managed. I'd like to thanks Michelle, Cassandra, Ruth, Senja and Yolande from Oracle for the great support (Speaker/T-Shirt/Fund) and thanks for Simon Ritter who present Java 7 in Cairo and provided a very comprehensible technical material to our speakers.